Helping You Pick the Right Laptop for Your Needs! On September 22, 2018 at 5:28 PM (GMT +5), I posted a Poll in a Facebook Group, asking the question we all are here to know the answer of. What is the Best Gaming Laptop Brand? Today, after 24 hours of posting that survey, I am here to share the results with you. But, if you do not want to read the whole post, let me just share my short and sweet answer with you. Honestly, It does not matter which is the "best"gaming laptop brand, or which one you go with in the end. All that matters, is that you simply write down what specs are you interested in, and then filter out laptops that DO have those specs, and then you can simply pick the one based on the laptop brand that you've had most success or satisfying experience with. Now that you've read MY opinion, let's go ahead and take a look at what those 100+ participants had to say about this question. Let us see what all those 100+ participants had to say. Which brand did they vote for the most? These votes are for the first part of the question, which is What is the Best Gaming Laptop Brand, in Your Opinion? But, I also wrote "Any Why" with it, as you can see in the picture. 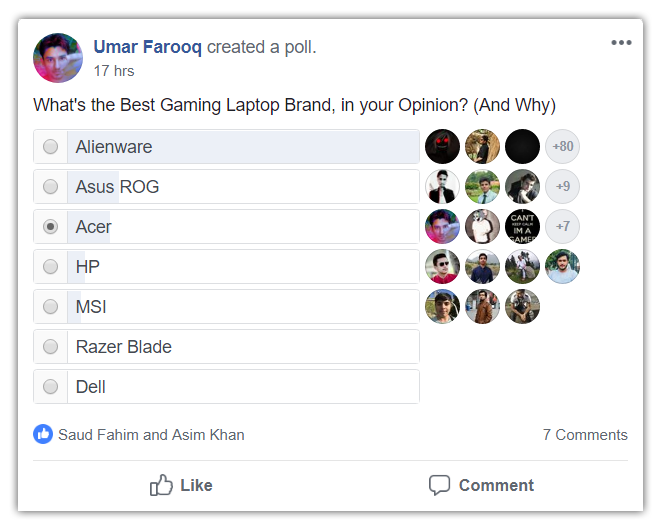 So, let's go ahead and take a look what are those 7 comments saying about that second part of our question, Why they think a specific gaming laptop brand is best? As you can see in the picture, Kifayat says that he does not have one yet, but perhaps he did some research and found out that Acer offers the best bang for the buck type of laptops. Which is the reason why I voted for Acer, as I own an Acer Predator Helios 300, as of now. 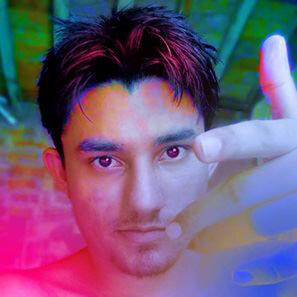 Ammar, on the other hand, says that Alienware is the best, but is overpriced in his opinion. I too think that Alienware gaming laptops and even desktops are overpriced. But, there's another thing, they charge for the quality and design mainly i think, the Swag that comes with buying an Alienware product, that's the main selling feature of their gaming laptops. And this person right here, is just making a sarcastic comment, lol. Just ignore him. He was one of the 7 comments, so I thought why not share what he had to say as well. 😁 Actually these laptops were crap, so he's just making fun of those crappy laptops, and calling them the best gaming laptops! Here, Kifayat, who says that Acer is the best gaming laptop brand, argues with Ammar who said that HP's Omen series is the best for gaming, and is cheapest of them all. You can read for yourself what these two are arguing about with each other. I think the Omen is a bit higher quality product, than Acer Predator Helios series. That is why they charge a bit more than these laptops, and offer a bit less in terms of specs. This is why I have gone ahead and bought an Acer Predator Helios 300, because it was the best laptop of 2018, and I couldn't find a better value laptop than the Helios 300 from Acer, for the least price. In fact, I have even said in my previous articles, that the Predator Helios 300 is still the best gaming laptop, in 2019, if you purely want a gaming laptop and do not have plans to do anything else, like editing videos or photos or something that mainly requires CPU power. If you feel that I've left a gaming laptop brand out, and it is not mentioned in the survey or poll, please share your opinion about that brand down in the comments below. Omar loves to talk about Technology and Gadgets. He mostly can't afford it, otherwise he'd love to purchase anything and everything that comes out every year, if it was possible.